All cages are fully assembled. 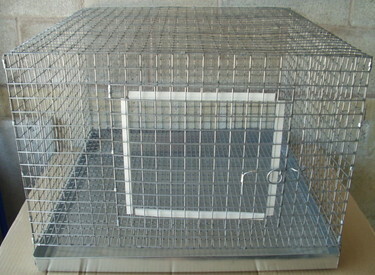 For those needing cages shipped, we can do them partially assembled as well. They are put together here until the point that they are still flat to save on shipping costs. You would need to have the j-clip pliers to finish assembly, j-clips are provided. 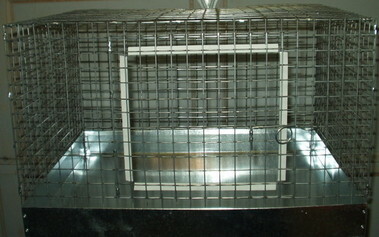 and come with a sturdy 28 gauge metal tray. Don't see the size that you need? We can build it! Contact us with your measurements and we will give you a quote. STANDARD TRAY HEIGHT 3" WITH A 3 1/2" FRONT. TRAY PULLS OUT OF HOLE IN FRONT OF CAGE FOR EASY CLEANING. CAGES CAN BE EASILY STACKED. URINE GUARDS CREATE A 7" WALL ON SIDES AND BACK TO HELP KEEP IN SHAVINGS. ( ANIMAL SITS DIRECTLY ON WIRE ) DROPPINGS FALL INTO TRAY BELOW. STANDARD TRAY HEIGHT 2". TRAY PULLS OUT OF FRONT OF CAGE.